Trip to Europe April, May and June 2011: Friday 20 May - Our last day in Paris. There are so many boulangeries close to us that it is very difficult to know where to shop. I went out early thin morning to buy croissants at three locations so that we could compare them. These are the bakers I went to. We enjoyed all three of them. Levis had less salt and, for that reason we preferred it, but all were excellent. We went to the Bastille this morning and walked along the canal to the Seine. We came across two old men who appeared to be brothers, identically dressed and carrying identical folding chairs. Clock strung out from the side of a church tower on the Isle de St. Louis. It was then on to the Isle St. Louis where we had lunch at a place we have been to before. In spite of the constant bickering between the husband and wife running the place we had a good meal although we were the only people in for lunch. Stained glass in the restaurant. Dessert was an ice cream from Berthillon. We had intended to walk through the Cite flower, market across and past the Louvre, through the Tuileries and Place de la Concorde. However it was so full of tourists that we gave up just after the Louvre and came back. A quick visit to Monoprix for food for the train tomorrow and we came back to the apartment. Late this evening we had finished our packing and were just getting into bed when there was a sound as if from an accordion right outside our window. 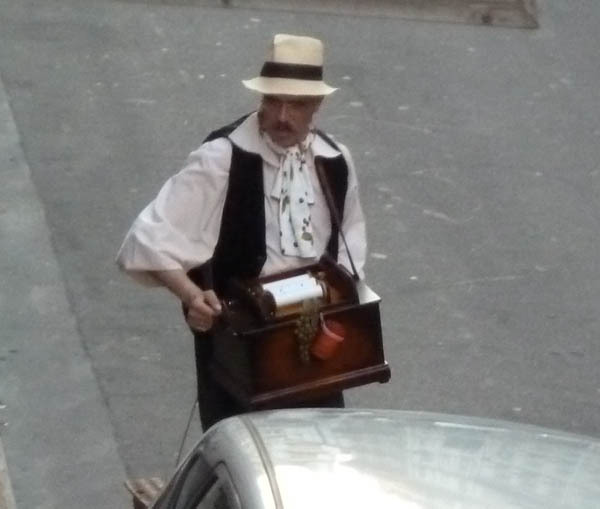 We saw an organ grinder with a hurdy girdy singing away to his heart's content. All the neighbours were hanging out of their windows, laughing and singing along. What a send off!